Younger small-sized rotundas and single-nave churches from the 11th and 13th centuries are also astonishing due to their peculiar impressiveness. They are proofs of the advanced Romanisation of our territory in that period. These monuments were built either by the Church or by nobility which determined their place within monastery complexes, within castles or on hillocks near to settlements or directly within settlements and their role was to support the power interests of a local ruler (zemepán). They were formally simple headquarters or longitudinal constructions crowned by semi-circular recesses; they had massive walls with narrow windows and plain arched portals. Interiors either included barrel vaults or plain flat wooden ceilings and they were decorated by murals with scenes from Biblical stories. One of these iconic structures is the fully preserved Church of St. Michael the Archangel in Dražovce built in the middle of the 11th century and is famous for its spire. The church is located on the edge of a spur high above its surrounding landscape. The older Church of St. George is also situated in the same region not far from Nitra. 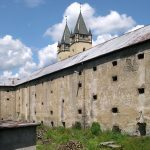 It was built in Kostoľany pod Tribečom in the first third of the 11th century and its purpose was probably connected with the missionary activities of the Zobor Abbey. Nonetheless, remarkable single-nave Roman churches can also be found in other parts of Slovakia. We should mention at least Saint Giles Church situated in Ilija in the Štiavnica Mountains, which is famous for its extraordinary stepped portal. The Church of the Holy Cross in Hamuliakovo is distinctive by its tower decorated by three compound Roman windows situated above each other or the Church of the Nativity of Our Lady in Čierny Brod (district Hegy) built out of common bricks – a typical material of the southern Slovak regions. Probably the most famous example of the then central sacred building is the Rotunda of Bény built around the year 1200 in Bíňa. It is unique in our context due to the structure of its interior – a shallow apse with a high portal and 12 arched niches in its perimeter wall. This is proof that Slovak architecture was influenced by Italo-Dalmatian architecture. But the rotunda is also remarkable due to its connection to the nearby Premonstratensian monastery built in the same period. Although only the single-nave St. Mary‘s Church with its two towers was preserved from the original complex, it is still evidence of the outstanding and intensive building activities carried out by orders of monks such as the Cistercians, the Premonstratensians or the Benedictines, who were very active in our territory since the 9th century. It was the Benedictines who built the first large monastery complex in Slovakia. A thirty metres-long three-nave basilica with a massive western facade dominated by two towers was followed by an atrium, dwellings for the abbot and for monks, a library, chapterhouse, scriptorium, dining hall and other areas of a cloister. Agricultural buildings formed the so-called external cloister. However, these fortified Benedictine brick monasteries are not preserved, but due to the archaeological finds and historical documents we can state that the remains of the abbeys found in Hronský Beňadik or in Skalka pri Trenčíne were undoubtedly the most dominant buildings of the 13th-century Slovak territory. St. Martin’s Cathedral in the Spišská Nová Ves region built in the 11th century also belongs to the network of Benedictian monasteries with missionary activities. The then development of the Church administration and also the significance of the Spiš region within the Kingdom of Hungary gave birth to the local provost and after 1209 it led to the construction of the provostry and its advisory body – the so-called chapter house situated on a hill eastwards from the original monastery. The most significant monument within the fortified area of provostry in Spišská Kapitula – (an exceptionally well-preserved ecclesiastical town on the outskirts of Spišské Podhradie) – was St. Martin’s Cathedral. Although the massive three-nave church has been greatly reconstructed, its western facade with two Roman towers, arched compact windows and distinctive stepped portal are still preserved. We can also find various characteristic Roman features within St. Martin’s Cathedral such as capitals decorated by leaf cocoons and berries or torsos of a sculpture preserved from the original decoration of the western facade – known as Leo Albus, which was a lion holding a book in his front paws. Spišská Kapitula was the most significant centre of Church hierarchy in the medieval Slovak territory. Its status was connected with the affairs of the nearby Spiš Castle – an important residence of Hungarian nobility of that period. The beginning of construction dates back to the arrival of Andrew II of Hungary’s son – Coloman of Galicia-Lodomeria – at Spiš Castle. He was crucial not only in the construction of the church, but also significantly contributed to the building activities in his castle. Construction on Spiš Castle, an integral part of the Hungarian Kingdom’s north-east border defence, began in the first half of the 12th century upon an older fortified site. Radical development of the castle complex began in the 1220s and 1240s, when Coloman of Galicia-Lodomeria reigned in the castle. Massive crenellated walls, a two-storey great hall, a cylindrical defensive tower and a chapel were built in this period. 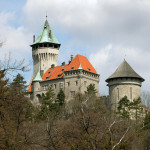 The shape of the castle was also influenced by its later owners, including the French knights Phillip and John, who owned the castle at the beginning of the 14th century, and the former Hussite mercenaries, called “brotherhood” (led by John Jiskra of Brandýs), who built up extensive fortifications in the castle’s glacis and, Stephen Zápolya who rebuilt the castle into a Late Gothic residence in the second half of the 15th century. Nearby Spišská Kapitula, Spiš Castle and the town of Spišské Podhradie together an especially impressive building complex to this day and are proof of the high-level architecture art of the medieval Spiš region. This site is one of the most important architectural monuments in the Slovak territory and it is inscribed on UNESCO’s World Heritage List, which confirms the statement. Earlier we mentioned that castles are one of the key elements of Slovak‘s genius loci. Their construction was, on the one hand connected to the defence of the Hungarian Kingdom’s territorial integrity, and on the other to its administration. 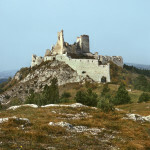 Whereas so-called “stronghold castles” provided the security of borders, the “lordly castles” served as residences of local administrative units – Župy. 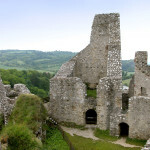 The most famous of them is a network of stronghold castles on the western border represented by Pajštún Castle, Plavecký Castle, Castle of Čachtice and the stronghold castles of the Považie region designed to defend trade routes. However, the biggest of them, Trenčín Castle – the residence of Palatine Matthew III Csák – played the most important role in the process of the nobility’s gaining ground against rulers in the first decades of the 14th century. 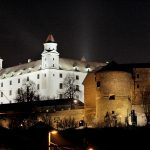 The most famous lordly castle was undoubtedly Bratislava Castle which developed from the significant church-administration centre of the Arpád reign an ostentatious royal residence at the beginning of the 15th century. Its reconstruction was initiated by the Hungarian, German and Bohemian King Sigismund of Luxemburg. For this purpose he called up the most renowned builders and artists from the whole kingdom. They built a great hall and significantly improved its fortification by applying the latest knowledge of Italian architecture – vaulted chambers with embrasures – known as casemates. Simultaneously with the construction of ecclesiastical, royal and aristocratic residences the structure of secular settlements was also levelling out? between the 12th – 14th centuries and the first towns began to appear. They emerged on the plans of former villa forensis (market settlements) or extramural settlements of castles located at the crossroads of trade routes close to fords, and later mainly nearby deposits of mineral resources. They prospered due to two waves of German colonization, and economic reforms by the House of Anjou that provided economic stability of the Hungarian Kingdom. The first free royal town in the Slovak territory was Trnava. It received its privileges in 1238 as the second town in the Kingdom of Hungary. The oldest towns in the territory of Slovakia include Bratislava, Nitra, Banská Štiavnica and Zvolen. The distinctive position in the structure of Slovak urban settlements is represented by mining towns such as Kremnica, Banská Bystrica and Banská Štiavnica, which prospered in the Middle Ages thanks to their gold, silver and copper, but also the Spiš towns that owed their prosperity due to their geographical location on international trade routes. The relatively dense structure of settlements ranked Slovakia among the most urbanized territories of the then Hungarian Kingdom. Rich medieval towns also tempted conquest missions. We should mention at least the Hussites whose invasions into the territory of the Hungarian Kingdom prompted Sigismund of Luxemburg to fortify towns in the 15th century. The typical shape of medieval towns is therefore represented by rather concentrated rows of town houses with a square, parish church and town hall fortified by city walls. Mainly mining towns and Spiš towns are still preserved in this picturesque form. The most remarkable are Bardejov, Levoča and Banská Bystrica, which are also inscribed on UNESCO’s World Heritage List.